Ron Church grew up on the family farm south of Killarney, where his family raised registered Short horn cattle and Clydesdale horses. Ron and his brother Garry took their early schooling in the village of Lena and progressed to high school in Killarney. Ron’s family travelled with their horses throughout Southern Manitoba and Saskatchewan, finishing the season at the Royal Show in Toronto. When Ron completed school he became active in the Agriculture Society serving as Director as well as Chairman. Ron has enjoyed curling and broomball in the winter. He has shown horses at the PNE in Vancouver and also in Washington State, and his family continued to show horses into the mid 80’s. After Ron’s father’s death he was elected as District Director of the advisory board for fairs in Manitoba. Ron has served as President of the Manitoba Association of Agriculture Societies as well as director. Ron has worked in farming for many years. He has also been a driver for the Turtle Mountain School Division and he continues to serve on the work place and safety committee.Grand Master Ron Church received his Master Mason degree in April 1986, in Killarney Lodge #50, which was the lodge of both his father and grandfather. He was honoured to serve as Master of Killarney Lodge for its 100th Anniversary. Ron served as District Deputy Grand Master for the 3rd Masonic District in 1996-97, and affiliated with Doric Lodge #36 in 2000. Ron became Master of Doric Lodge #36 in 2005. Ron became a member of Royal Arch, Council and Perceptory Chapter #15 in 1995 and in 1999 he became First Principal. Ron has attained membership and titles in many Masonic bodies including: Royal Ark Mariners, District Superintendent for District #2, Grand Chapter of Manitoba in 2005, Grand First Principal in 2009, GIG for Cryptic Masons of Western Manitoba, Grand Valley Concave Red Cross of Constantine in 2005, becoming Most Puissant Sovereign in 2011, Member of Holy Order of High Priesthood and YKCH, Order of Secret Monitor, Past Sovereign Keystone Council #174 Allied Masonic Degrees, Member and Past Governor of Manitoba Crocus College York Rite College of North America, and Member of Valley of Brandon Scottish Rite he served as Most Wise Sovereign in Rose Croix. In 2012 Ron was elected as Junior Grand Warden, Senior Grand Warden in 2013 and Deputy Grand Master in 2014. 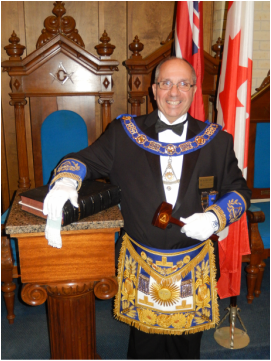 Freemasonry is a very important part of Ron’s life, he is truly humbled by the honor to serve as Grand Master of Manitoba.